Distinct developmental origins contribute to white adipose tissue (WAT) and brown adipose tissue (BAT) in mice. In the trunk, white adipocytes arise from adipocyte progenitor cells (APs) present in the mural wall of WAT blood vessels (truncal WAT). These APs could stem from lateral mesoderm-derived mesenchymal stem cells (MSCs), which originate from a common endothelial and mesenchymal cell precursor which also gives rise to the subcutaneous progenitor population. In contrast,,white adipose depots in the head originate from the cranial neural crest, and not the mesoderm progenitors. 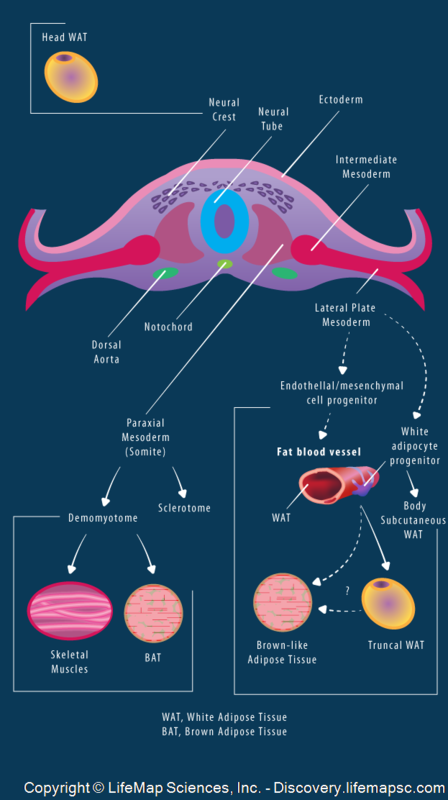 BAT and skeletal muscles share a common developmental origin, which is distinct from WAT. They originate from paraxial mesoderm-derived progenitor cells residing in the dermomyotome, a somite sub-domain. It is assumed that some WAT progenitor cells can transdifferntiate to give rise to 'brown'-like progenitor cells.